The effect of that background is stunning Sylvie! Together with that elegant die cut it's one terrific card! What a great idea must give it a go. Love this Sylvie - just beautiful. Sylvie I absoloutly love this card.. The design is stunning. I love the colours too.. Green is my fav colour. Stunning card Sylvie! Love the first card you made too and your black and white Christmas card is gorgeous! Beautiful card Sylvie, Happy Easter. Beautiful card Sylvie, I gave this technique a go the other week, but haven't had a chance to use the card yet, you have given me the incentive! Wow, Love this card, so fresh and clean. Hi This is a fab card I love the technique you have used. It is one I have looked at but never tried. Seeing your card makes me want to give it a go. Thank you for stopping by and leaving a lovely comment on my blog. Oh WOW Sylvie what a gorgeous card. Beautiful card. Have never heard of this technique but have to try it. What a great technique! I do intend to try it when we have some flowers out in the garden. It's such an elegant card. Great finished look and gorgeous shades of green. Your weather sounds a million times better than ours .. .. but that said we do need rain otherwise we are going to be facing big problems water wise come summer. I hope you had a good Easter. 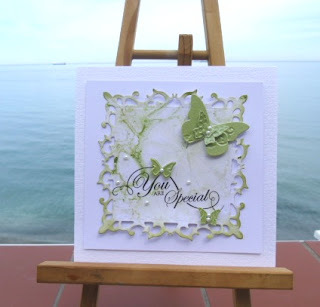 gorgeous card and I've had a lovely wander round your blog too which I haven't come across before! Beautiful card Sylvie. I loved visiting your blog and thanks so much for dropping in and saying hello. I hope you will return soon. Sylvie, that background is just beautiful! I love the variations of the greens...and the butterflies with the pearls are the PERFECT accent! oh what a gorgeous card, sylvie!! so elegant! Such a pretty card! The butterflies are gorgeous.